The UK Independence Party says a Polish MEP has joined its Eurosceptic grouping in the European Parliament, paving the way for significant EU funding and committee posts. The EFDD group was thrown into disarray last week after a Latvian MEP left. 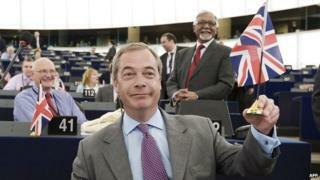 Now it is "back with a bang", UKIP announced, welcoming Polish MEP Robert Iwaszkiewicz to its ranks. European Parliament rules say party blocs have to have at least 25 MEPs from seven different countries. The EFDD (Europe of Freedom and Direct Democracy) says Mr Iwaszkiewicz has been officially registered as a member of the group, restoring the EFDD's status. The EFDD has 48 members - half of them UKIP politicians - in the 751-seat parliament. In total, Eurosceptics account for about one-third of MEPs. "We will now make the EU's centralising fanatics regret their short-lived bout of hubris," UKIP leader Nigel Farage said in a statement. He blamed European Parliament President Martin Schulz for the departure last week of Latvian MEP Iveta Grigule. He accused Mr Schulz, a German Socialist, of "manipulative backroom politics of the worst kind". "EU Federalists will be sitting in a corner somewhere slowly rocking, muttering the words 'please make the Eurosceptics go away' over and over," Mr Farage said. Last week Mr Schulz denied any wrongdoing in connection with Ms Grigule's decision to leave the EFDD. Mr Iwaszkiewicz said he joined EFDD "because of two important values - opposition to EU bureaucracy and support for free markets".